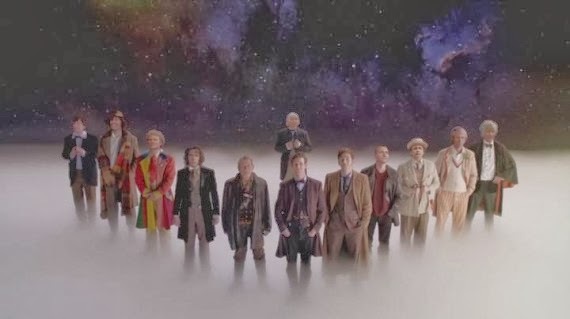 It’s kind of hard to believe that the Doctor Who 50th Anniversary Special has now come and gone. As a latecomer to the party, I’ve still been a fan of the show for a full third of my life, and even went so far as to write my college thesis on it. That thesis? Was how I ended up doing this, talking to all of you nice people about popular culture. So, sometimes it’s hard to stop and think about how much Doctor Who has impacted my life. Well, now that that’s out of the way, let’s rip this special to shreds! I kid. Somewhat. The Anniversary Special, heretofore to be referred to as “The Day of the Doctor” was good, fun, very Whovian, and a pleasant romp through some nice nostalgic bits of Old and New Who. There were guest appearances, lots of Doctors, and a reference to the running gag with Queen Elizabeth I. All that is lovely. But there were things, other things, that weren’t so lovely. Not that anything in the special was awful or offensive or anything like that, just that, well, I wanted more. I liked it, but I didn’t love it. I didn’t cry. And I have it on good authority that I’m not actually dead inside, so it wasn’t just me. This special didn’t connect to me in the way I really wanted it to. And I think I know why. If you’re reading this, I assume you’ve watched “The Day of the Doctor” and therefore will not be recapping it. But generally, SPOILERS. There are a lot of parts of the special that I quite liked. I enjoyed getting to see pieces of Old Who woven in with the new, and honestly it was refreshing to get to see bits of Gallifrey again. While I appreciate the decision the show made to separate The Doctor from his home planet in the new series, I miss the place. It’s a cool place, and there were always interesting stories to tell there. So, I liked that we went back. I thought the premise of the episode, that The Doctor must make a moral choice about whether the good of the many outweighs the good of the few, was very timely and emotionally convicting, but I do think that it stumbled a bit in execution. While I loved all the parts with John Hurt and Billie Piper snarking at each other and having deep philosophical debates, I hated all the stuff with the Zygons, which was cheesy, and was utterly bored by Elizabeth’s inclusion in the plot. Didn’t need her. Just made it more confusing. Like always. Actually, while I enjoyed the episode, especially the parts where John Hurt’s Doctor got to stare into his own future and confront the reality of his choices, I felt a bit let down emotionally. It was all just so…Moffat. You know what I mean? Maybe you don’t. Here’s what I mean: I mean that it was all flash, and no real substance. It was clever, full of witty lines and silly moments, with lots of running and zippy dialogue and beautiful women saying just the right thing at just the right time. It had space art and the importance of saving children and Billie Piper vamping it up in weirdly post-apocalyptic sweaters. But it didn’t make me cry. It didn’t have emotion, real emotion at its heart. I’m not entirely sure why this special didn’t emotionally connect for me. It might be because neither Smith nor Tennant is really “my” Doctor – I swear fealty to Christopher Eccleston, who wasn’t in this one. Or it could be because even though we felt a little bit of the chaos on Gallifrey as the Time War raged we’ve never actually gotten a really good feeling of what that war was all about, and therefore an entire episode debating the moral intricacies of a conflict we really know nothing about was kind of weird. Or it could be that I am sick and tired of hearing about the damn Time War, and I want us to talk about something else. Because I’m tired of The Doctor being a “lonely god” or “the only one who can save us now” and I want him to just be The Doctor again, a weirdo who stole a time machine because he didn’t want to be a grownup anymore. I miss The Doctor helping people not because he’s the only one who can, but because he’s in the neighborhood and it’s the right thing to do. I miss the everyday courage of Doctor Who. I’ve had my fill of prophecies and universe saving heroics. I want The Doctor to help a shopgirl see the stars, or try desperately to get a flight attendant to the airport on time, only to constantly be hijacked off into time and space. I want The Doctor to do normal things with normal people and have them be extraordinary for no other reason than that they might as well be. I’m done with exceptionalism. I want The Doctor to be a man again. Again, this could just be me, but I really don’t think it is. Like I said in the Rose Tyler article, I love characters who are ordinary people put in extraordinary circumstances. The Doctor’s never going to be exactly normal, sure, but he can be normal-esque. He doesn’t really have any special skills, does he? And his preferred weapon is a really useful screwdriver. He runs from his problems. He’s just like half my ex-boyfriends in that sense. What I mean is, I want to be able to relate to The Doctor. I think we’ve missed that. We’ve gone way too far in the other direction. And having Clara be the companion, pretty, perfect Clara, certainly doesn’t help. Because Clara always knows the right thing to say. She’s the one who opens the door everyone else thinks is locked. She can tell when The Doctor’s about to make a decision and talk him around about it. She can do anything. She’s magic. I mean she’s literally magic. We established that last season. And have I mentioned how much I hate that? Because I do. I really do. Can’t we have someone normal on this show for once? Seriously. I am really sick of everyone having a destiny or an epic journey or some kind of “only _____ in the universe” deal going on. It’s exhausting. Speaking of exhausting, it was a bit tiring seeing Matt Smith and David Tennant enthuse at each other during the show. While both of them have very different takes on The Doctor, their styles are similar enough that having both on screen at the same time was hard. It was just so…bouncy. Flippant. Hair gelled. Though, seeing the two of them together did give me the lovely mental image of seeing Christopher Eccleston and Peter Capaldi being The Doctor at each other, all repressed swearing and angry eyebrows. And that made me happy. On the list of things I actually quite liked about the special, and I know this one is controversial, I personally loved that Rose wasn’t actually Rose in this. I am aware that this is virtually heresy, especially since I have established that I love her character, but hear me out. I didn’t want Moffat to really get his hands on Rose to begin with, because I don’t trust him, but also because I quite like where Rose ended up. I mean, think about it. She lives in a parallel reality where her mother and father are alive, happy, and together. Where she has a baby brother and a job she loves. Where people ride around in zeppelins. Oh, and she happens to live with another version of The Doctor, one who can kiss her and love her and grow old with her. I really, really didn’t want to see a story where Rose wasn’t in that happy world anymore. I want her in that world. It’s a good world. So seeing that Rose wasn’t Rose here, but rather an Interface taking Rose’s shape was pretty cool. It meant that we got some nice Billie Piper action, but that it didn’t take over the story. Also cool? The idea that after The Doctor regenerated into his next form (Eccleston’s Doctor) he retained some vague memory of a “bad wolf” and a pretty blonde girl. And then he met Rose. I do like that it comes full circle there. And I have to admit that I like that the whole thing about The Doctor murdering everyone he’d ever known has finally been resolved. That’s a good thing. Maybe we can get away from the lonely god stuff now. Please, please let us get away from it. But here’s my real disappointment with “The Day of the Doctor”: it wasn’t as good as the story I had in my head. And that’s always a bummer. Now, the story in my head, what they could have done, though not what I actually expected them to do, isn’t particularly filled out, but I think it stands. I didn’t want to hear about the Time War. I didn’t want to discover a new, unspoken regeneration. And I really didn’t want to see David Tennant’s Doctor kissing people to figure out if they’re Zygons or not. No, I wanted to see The Doctor before he became The Doctor. I wanted to see what he was running from all those years ago. I wanted to see the man before. 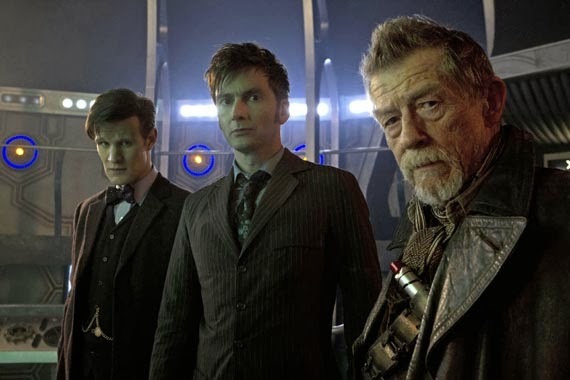 Imagine that John Hurt wasn’t playing another regeneration of The Doctor, but rather an earlier age of a regeneration we’d already met. By that I mean, his first regeneration. That John Hurt was playing The Doctor before he was The Doctor, back when he went by his real name, when he was friends with The Master (really friends), and when he lived on Gallifrey. What happened? What was so wrong that he ran and never stopped running? What did he do that made him decide to never ever do any harm again? That was what I wanted to see. And while I can appreciate that this episode was very clever and pretty and well done, which it was, it wasn’t what I actually wanted to know. And none of it touched my heart. Call me a romantic, but aren’t things like anniversaries supposed to be about heart? Isn’t something like the fiftieth anniversary supposed to let you feel the things you’ve always loved about the show, and to drag your emotions around? I don’t want something clever. I want something true. I also want Moffat to not be the showrunner anymore, to be honest. I think it’s time we had a bit more feeling and a bit less clever. Eccleston is amazing and pretty criminally underrated. And the ears are adorable. The 50th was much more based in the later seasons, which was okay, I guess, but the show's been a bit formulaic for a while, so I think that made me a bit sad. I liked it, but I didn’t love it. I didn’t cry. And I have it on good authority that I’m not actually dead inside, so it wasn’t just me. It's almost a relief to disagree with you about something at last. :) (I don't mean you're dead inside, obviously, I mean I did love it). (And I did tear up, at the part when Ten and Eleven put their hands on the Moment's button along with John Hurt's). 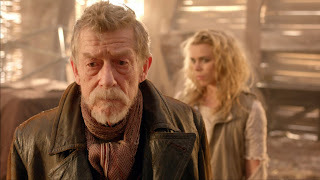 Actually, while I enjoyed the episode, especially the parts where John Hurt’s Doctor got to stare into his own future and confront the reality of his choices, I felt a bit let down emotionally. This is probably why I liked it better than you, because this is what did touch me. A weapon that's become intelligent to learn what it is and decides there should be a better way - I can't think of anything more perfectly Doctor Who. 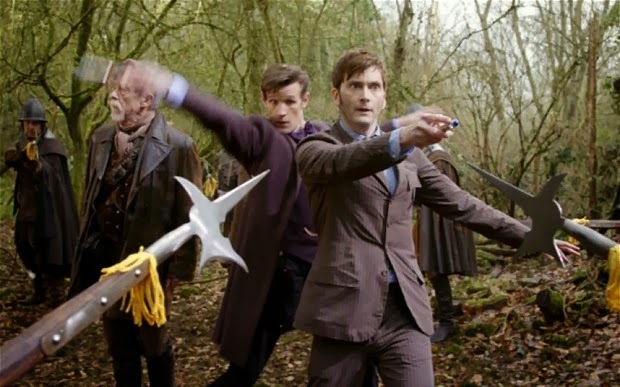 As the Time Lord said, "[Who'd] use a weapon that could stand in judgement over you?" - answer: the Doctor, because he'd feel he deserved to be judged for it (by anyone but the TARDIS, at least) - and because of that one facet of who he is, Gallifrey was saved. I miss the everyday courage of Doctor Who. I’ve had my fill of prophecies and universe saving heroics. I'm with you there, though. I'd also like the next compansion not get a "title" - so far, Martha's the only one who hasn't. I mean she’s literally magic. We established that last season. 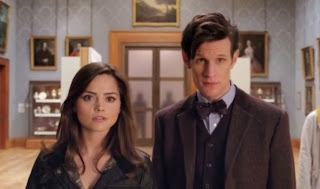 I don't see Clara as magic, or rather, I don't see how she's magic if Rose isn't - both were born and grew up normally, took off with the Doctor, did something huge, which left traces throughout time, which we got to see before the event itself - the only difference is that we knew early on that Clara was connected to the season mystery. That quibble aside, I'd have dearly loved to see Amy instead. Her relationship with the Doctor is more interesting, *she's* more interesting, and her interaction with a Doctor as broken down as John Hurt's would have been something special. Especially since she's committed a murder of her own. On the list of things I actually quite liked about the special, and I know this one is controversial, I personally loved that Rose wasn’t actually Rose in this. *Now* we're in agreement. Apart from anything else, it says a lot about Rose that the Moment would choose her as its guide - and a lot about the TARDIS and her "where you needed to be" attitude to the their travels that she took the Doctor pretty much straight to the real thing afterwards. Also, Billie Piper did a great job of playing a completely different "person" that had donned Rose's demeanour. I'm impressed at how well they managed to forstall any rumour of all the Doctors appearing in the climactic scene - let alone the actual appearances of Tom Baker and Peter Capaldi. And it least that we meant we *a* line from Eccleston, even if it was one he said earlier. 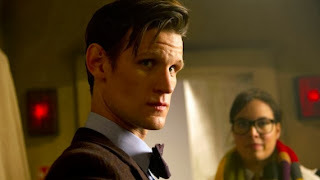 I so want to see Osgood again. (I heard she was only in it because they couldn't get Lee Evans back as Malcolm; in which case I'm really glad they didn't, because Malcolm was *too* comical; Osgood I can see actually having a serious role in something). Yeah, I wish I could've been emotionally invested in this, but I wasn't. It was sad. Did love Osgood, though. I hope she comes back. I feel like she would be an awesome companion for 12. I have got to say that I love your blog and I totally agree with you. Even though I haven't watched any episodes with Matt Smith except for The Day of the Doctor yet I feel like Moffat is not the right man for the job. As I mostly like Russel T Davies episodes the most because of how good he was and that Moffats writing in the current episodes I've seen isn't like those episodes I love. The Day of the Doctor was good, but nothing more. It didn't feel as though it celebrated the passed 50 years with Doctor Who. I wanted more old companions and not only Clara. YES. Me too. I was personally really rooting for Ace to show up. Ace is the best.